Ancient Digger Archaeology: Could Akrotiri Be The Lost City of Atlantis? > Could Akrotiri Be The Lost City of Atlantis? Could Akrotiri Be The Lost City of Atlantis? Akrotiri lies on 49 acres on the Cycladic island of Thera. 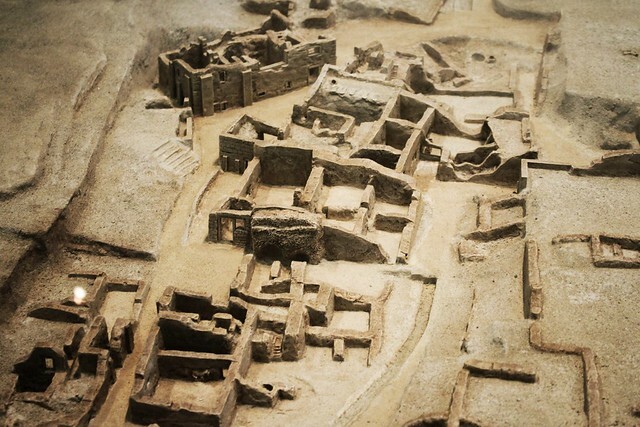 During the Bronze Age, Akrotiri was quite impressive with its elaborate construction. The town was occupied in the Late Neolithic period, but evolved into a major town in 2000BC. Like Pompeii, Akrotiri was the site of a volcanic disaster. The island, with its center hollowed out, left a crescent moon shape. The dates of the volcanic eruption and disaster are a bit fuzzy. Archaeologists have dated the disaster to around 1550 B.C.E, however scientific evidence places the event a century earlier in 1650 B.C.E. During the Late Neolithic period hydraulic systems were paving the way for new states, as is evident in the elaborate drainage system at Akrotiri. There were also streets, squares, and houses built up to a height of 26 feet. The town was the epitome of a state society with blocks of houses, freestanding monuments, and elaborate buildings constructed entirely out of stone. Typical of the Neolithic period, food stores were discovered as well as preparation areas and crafting rooms. 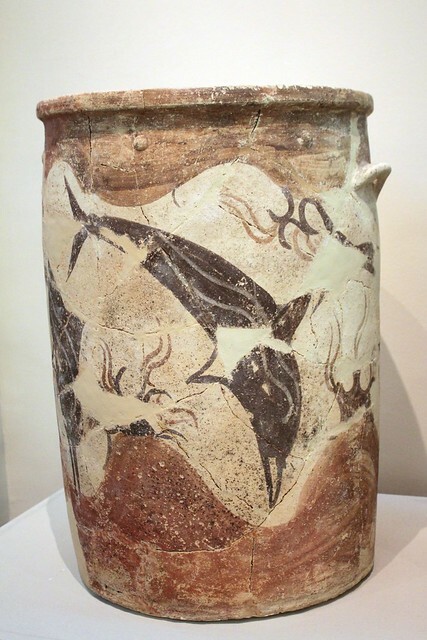 The material culture, consisting of vast quantities of pottery and metalware, indicates a connection with the Near East, Cyprus, Dodecanese, the Greek mainland, and Crete. The frescoes at Akrotiri are exquisitely preserved, many depicting ritual scenes of women gathering saffron, boxing men, fisherman, decorative rosettes, and blue monkeys. Further excavation turned up a single gold artifact. The Gold Ibex found in 2007, on display at the Museum of Prehistoric Thera. Also featured at the museum are firedogs, a volcanic ash cast of a wooden table, ewers, animal figurines, and a Marble schematic figurine. Interestingly enough, no skeletal remains were ever discovered at Akrotiri, leading experts to believe there was an evacuation prior to the volcanic eruption. The question is where did everyone go? Like many other locations in Greece, Akrotiri was believed to be the site of the fabled city of Atlantis. Atlantis was first mentioned by the Greek philosopher Plato, and although his stories invoke true skepticism by scholars, others believe there’s some truth and may have been inspired by true events in Akrotiri. The site is unfortunately not open to the public, although the hope is it will reopen in 2010. The main reason for this delay is because in 2005, the roof structure protecting the site, collapsed just prior to its completion in 2005, killing one patron.